According to one estimate, more than 15 million American adults don’t keep their money in a bank. That means they’re using check-cashing stores, payday loan companies, pre-paid debit cards and other non-traditional services that sometimes charge high fees — and provide little or no protection for money if it’s lost or stolen. Helping people who are “unbanked” is just one goal of the Financial Opportunity Center operated by Mon Valley Initiative, in cooperation with Neighborhood Allies. MVI’s Financial Opportunity Center is part of a network created around the country to provide one-on-one coaching for people who have bad credit or no credit, or who need help managing their family finances, including advice on how to navigate banks and other financial services. Our employment and financial coaches work with participants on the best ways to increase their income, decrease or control their expenses, and use banks and credit. We help people create a budget and set personal financial goals that they can meet and exceed. Besides one on one sessions, we also offer events throughout the year, like our fall “Tackle Your Financial Future” workshops. And our Financial Opportunity Center also works closely with our career development services and our counseling program for people who want to buy their own home. And like those services, the Financial Opportunity Center is free. We’re also part of the Pennsylvania Housing Finance Agency’s statewide network of counselors who are helping people just like you learn how to take charge of your money. 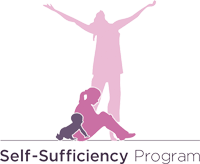 This DHS Self-Sufficiency Program is funded in part by a grant provided by the Pennsylvania Department of Community and Economic Development.